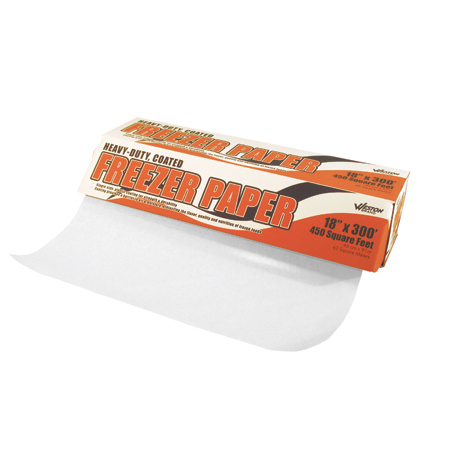 You�re viewing our Weston heavy duty freezer paper in dispenser/cutter box � 18" x 300' roll. Weston's freezer paper dispenser/cutter makes wrapping meat easy, simply pull paper from dispenser and tear paper. The spring-loaded cutting blade makes it easy to cut sheets of freezer paper while wrapping meat, perfect for home or commercial food service use. The sturdy legs have predrilled holes for extra stability, simply mount the dispenser on a table or wall. If you have questions about our products we are here to help you. 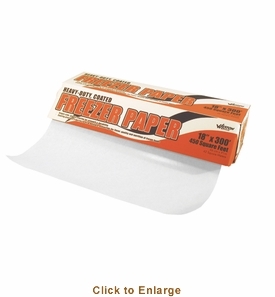 Scroll down to view our Weston heavy duty freezer paper in dispenser/cutter box � 18" x 300' roll.